PanARMENIAN.Net - Scottish National Gallery is the UK’s exclusive host of the first major international exhibition of the work of pioneering French landscape painter Charles-François Daubigny and his influence on the Impressionists, Art Daily reports. This summer the National Galleries of Scotland stages the first ever large-scale exhibition to examine the important relationship between the hugely successful landscape painter Charles-François Daubigny (1817-78) and the Impressionists, including two of the most celebrated and popular of all European artists, Claude Monet (1840–1926) and Vincent Van Gogh (1853-90). Inspiring Impressionism: Daubigny, Monet, Van Gogh is one of the highlights of the Galleries’ summer exhibition programme. The exhibition brings together 95 works from across the world in an unprecedented collaboration between the Scottish National Gallery, the Taft Museum of Art in Cincinnati, USA and the Van Gogh Museum in Amsterdam. The Scottish National Gallery exclusively hosts the UK’s only showing of this exceptional display. Inspiring Impressionism features major paintings by all three artists, on loan from many of the greatest art collections in the world, including the Musée d’Orsay, Paris, the Metropolitan Museum of Art, New York, and many other American museums; from London the British Museum, the National Gallery and Tate; and the Rijksmuseum and the Van Gogh Museum in Amsterdam. Re-evaluating the origins of the Impressionist movement, the exhibition not only demonstrates the profound influence Daubigny had upon the Impressionists, but also examines their reciprocal impact on his later style, with the full range of his output represented, from his finished ‘official’ paintings to his smaller oil sketches painted directly from nature. 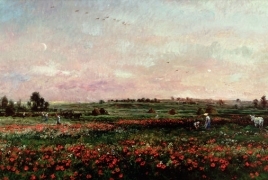 A series of fascinating and often surprising juxtapositions have been put together for the very first time, offering visitors the unprecedented chance to compare the show’s three featured artists’ varied treatments of a selection of motifs which held a common attraction for them – orchards, sunsets, poppy fields and river scenes. Other significant comparisons have been made with important works by Camille Pissarro (1830-1903) and Alfred Sisley (1839-1899). Daubigny’s influence on the young Monet is readily evident in the latter’s large and early painting, shown at the official Paris Salon in 1865, Pointe de la Hève at Low Tide, a major loan to our exhibition from the Kimbell Art Museum in Fort Worth, Texas. This shows the younger artist responding to Daubigny’s Cliffs near Villerville, another of our star exhibits, which also depicts the Normandy coast and had been shown at the Salon the previous year (1864). Both paintings are dramatic landscapes with brooding storm clouds and a sea turned to a milky jade by breaking sunlight. In both pictures formal composition is combined with fresh observation of nature. They demonstrate a similarity of intention between the two artists at this stage and this artistic dialogue would continue in the following decades.